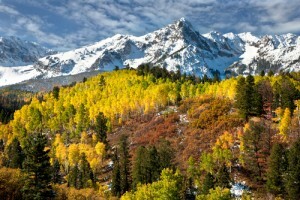 When people think of Colorado, they think of the Rocky Mountains, snow, and cold winters. It is not a place that people equate with solar energy, but nothing could be further from the truth. Colorado may have snow and mountains, but something it also has is clear skies throughout the year. In fact, out of all the states in the country, only three states have more sunlight (Arizona, Nevada and New Mexico). Today, Colorado has great tax breaks, incentives and rebates, as well as one of the most favourable net metering laws in the country, and the entire state is booming with solar power because of that. For anyone living in Colorado, solar power is a viable option that needs to be considered as a way to save money on electricity bills, increase self-reliance, and help reduce our dependence on foreign oils and the proliferation of fossil fuels. Plenty of sun – As has already been mentioned, Colorado has more sunlight than the majority of the rest of the states in the country. As such, there is a great deal of potential to generate electrical energy in the state. Government support– With local suppliers of solar panels, a high governmental commitment to solar energy, and a huge amount of sunlight, Colorado is one of the best states for solar energy installation. The installed capacity of the state has been rising quickly as well, showing a commitment by companies and the government towards using solar energy. From 2007 to 2013, the capacity of the state’s solar energy grid rose from 14.6 megawatts to 360 megawatts. The year 2012 was one of the biggest years for the increase of solar panels state-wide, with 102 megawatts being added in that year alone. It is not only consumers looking at Colorado for solar energy. Companies are setting up huge solar energy plants, to accompany the many smaller ones that already exist there. 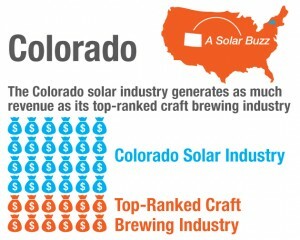 Colorado is also a focal point for the creation of the components of solar energy. General Electric is currently building a solar panel plantthat will produce 400 megawatts of panels each year, out of Aurora, Colorado. In addition, there are several solar power plants in the state, with the San Luis Valley Solar Ranch being the largest. Each year, it generates 30 megawatts of electricity. If you are thinking of installing solar panels at your house, you can’t go wrong if you’re living in Colorado. You can find out more about the savings and the cost of a solar power system by talking with a local solar installer we recommend. Click here for quotes. The Renewable Portfolio Standard is a regulation created by the government to increase renewable energy production by placing an obligation on companies who supply electricity, to produce a portion of their electricity through renewable energy resources. It is implemented worldwide, and in 33 states in America. Colorado is one of the leading states in the country with the Renewable Portfolio Standard. In 2010, the House Bill 1001 was passed that required the portfolio standard to rise from 20 to 30 per cent. This increase will cause the number of solar energy jobs in the state to rise from 2,500 to 33,500 by 2020. It will also generate nearly $4.5 billion in revenue for the state through the industry. The high level for the Renewable Portfolio Standard exceeds nearly every other state that uses the standard. It should also be noted that Colorado was the first state in the country to initiate a state-wide Renewable Energy Portfolio Standard. Current Colorado Electrical Prices, What Are the Savings? Currently, Colorado has some of the cheapest electrical prices in the country, thanks in large part to the commitment of the state’s electrical companies to providing solar energy. Currently, the average monthly bill is $81, which ranks 48th in the country and is 24.3 percent lower than the national average. While it is low, you can pay next to nothing when you install solar panelson your roof and take advantage of the abundant sunlight in the state. 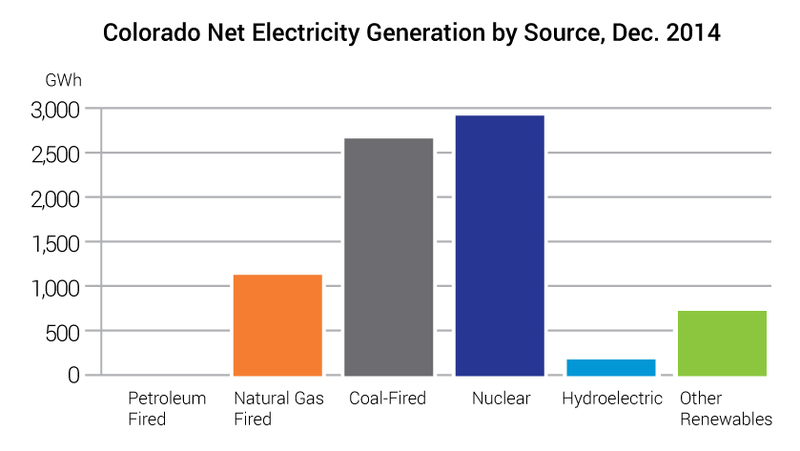 Currently, the average cost per kilowatt hour is 16 cents in Colorado, and that price is expected to rise to nearly 40 cents per kilowatt hour by 2030. For this reason alone, solar energy panels on your roof just makes sense. The average monthly savings when you use solar panels on your home in Colorado, amounts to about $40. This means that you can cut your bill in half at least when you install solar panels on your roof. You can find out more about the savings and the cost of a solar power system by talking with a local solar installer we recommend. How Long Does It Take to Pay for the system? How long it takes to pay off your solar panel system depends on whether or not you decide to purchase the system outright, or lease it. If you purchase the system outright, you will pay around $20,000 to $25,000 not including federal rebates and state rebates, which can increase your savings by as much as $10,000 for you. In this scenario based on monthly savings on your electric bill, the first year of savings will be around year 10 or 11. Considering the system can last at least two decades and beyond, this means you will have it essentially paid back barely halfway through the system’s life. If you decide to lease the system, you don’t pay that large upfront cost, but you do pay roughly $65 per month to lease it. Nonetheless, you will have your first year of savings in year four. What Are the Incentives and Tax Breaks for A Homeowner in Colorado? There are many incentives and tax breaks for homeowners who want to move to solar power in Colorado. Many electrical companies also offer rebates for their customers. Two major incentives are for residents of Denver and Boulder. The Solar Grant Program in Bolder provides up to 15 per cent off the sales and use-tax paid on materials and permits for the installation of solar installations. Another program is the EnergySmart system in Boulder County, which has provided $1.4 million in rebates to 12,500 homes in the county. The program also provides financing for homeowners to install solar energy panels. In terms of companies, Colorado Springs Utilities offers its customers a $1 per watt rebate until June 30, at which point it will be 50 cents per watt, for solar energy installations. There are many additional incentives available for Colorado residents. The incentives can be varied and depend on your exact location and utility company, the size of your desirable system and more. 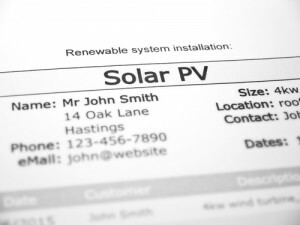 We always recommend our readers to simply talk to a local solar installer in your area. Our recommended companies are professional, trustworthy, and know your location benefits inside out. Colorado has some of the best solar power rebates in the country and it should come as no surprise for a state that often leads the nation in solar energy. While there are many county and city governments offering rebates, the utility companies really stand out. Colorado Springs Utilities offers $1,500 per kilowatt for up to $15,000 in rebates, while Holy Cross Energy also offers $1,250 to $1,500 per kilowatt for up to $15,000 in rebate savings. La Plata Electric Association, Poudre Valley REA, San Miquel Power Association and United Power all offer rebates that provide a cap on savings from $1,800 to $3,500. Are There Any Tax Credits? While Colorado is a leader in solar energy, the state itself does not offer any tax credit on solar energy. One reason for this might be that there are many rebates and grants elsewhere through local governments and utility companies. That being said, the federal government does offer a huge 30 percent federal tax credit, which can generate massive savings for your investment. Are There Any Tax Exceptions? The state of Colorado offers several tax exemptions that make buying solar energy systems much easier for the consumer. When you install solar energy panels on your home, it raises the value of your home by thousands of dollars, and a return of investment of up to 15.4 percent on energy savings alone. In Colorado, homeowners who have installed solar energy panels on their roof are not, in any way, required to pay a tax on the value of those solar panels. That means that when a home is sold, taxes on the sale are not paid on the increased value that comes from the solar panels. There is also a sales tax exemption on solar panel purchases. A full 100 percent of the sales and use taxes are exempted so you only pay for the value of the system, never the taxes on top of it. What Are the Financing Options and Can I get Solar with 0 Down? There are many financing options related to installing solar panels on your roof, and many companies in Colorado now offer $0 down payments. Depending on the plan, you can get solar panels installed for free, only paying for the monthly fee of the panels each month. Adding together your new savings on your energy bill, and the cost of the solar panels per month, still generates huge savings for you. If you are thinking of installing solar panels at your house, and you want the $0 down option, we can help you find a trusted local supplier. you can disccuss all of your options with him.Click here to go solar with Zero down. Leasing Vs Purchasing: What is Best for Colorado Residents? There are benefits to both leasing and purchasing in Colorado. If you don’t have $20,000 or so to pay, leasing may be your only option, but don’t forget about the rebates you can get for buying the system. Financing a solar energy leasing is very easy to obtain, and you don’t have to pay that large cost, but you do often have a larger monthly payment on the system, than if you bought the system outright. It should be noted that if you lease, you forfeit any credits and payments on performance, which you get when you own the system. If you want solar energy now but don’t have the money, start leasing. Otherwise, buy it outright. Net Metering is a service in which a consumer can get credits on their bills, or money, on the energy they produce. The utility company tracks how much you produce and how much you use, then stores the remaining power in the form of credits or cash. Colorado is one of the best states in the country for net metering policies. The state pays for the net excess energy, and that actually allows you to make a profit on your energy generation in your home, nullifying your entire electric bill. Colorado, along with a handful of other states, are the only ones to have an A rating from the Network for New Energy Choices. The Feed-In Tariff offers contracts to renewable energy producers, based on the cost of generating the technology. Doing this provides price certainty and contracts that finance renewable energy investments, which then lower the cost of renewable energy to residents. Currently, Colorado does not have a Feed-In Tariff system in place. Long story short, if you live in Colorado, you really cannot afford not to use solar energy. The state provides huge incentives on a local and company level, it has a great deal of solar energy raining down on it, and it provides massive benefits including getting paid for your energy and not paying taxes on the value of the system or the initial purchase. You not only help yourself by cutting on your utility bill, but also, you are helping the environment, by using clean sustainable energy, which can be benefiting for future generations to come. To learn more about the benefits of going solar in Colorado, our advice is to talk to one of our recommended local experts, get a Free, no obligation solar quote for your PV system today.